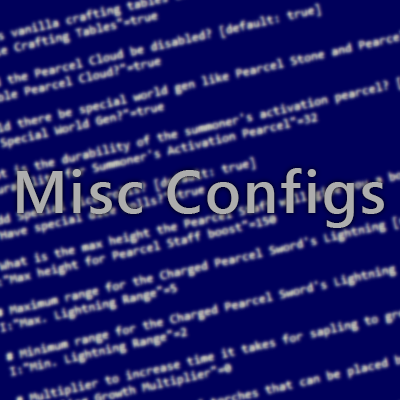 This mod adds miscellaneous config settings to the game. It's intended use is for mod packs or modded servers to control certain aspects of the game, whether it is disabling vanilla crafting tables or to slow down tree growth. Ability to disable the usage of chest,enchanting table,crafting table and furnace. Set different colors for chat messages. Ability to add an greeting message. More config options will be added as per request, however, only 1.12 is supported at this time. This mod was originally made for and because of Parcel31u's mod pack, Material Energy^Natural Capital. I'm looking for a mod that allows me to disable specific enchantments. I'm not sure how easy/hard something like that would be. Could you add a feature to your 1.7.10 version that allows modpack authors to set custom villager trades? I added a few spoilers with my suggestions for the sake of organization. If I wanted a farmer (specifically a shepherd) to sell me a single wither skeleton skull for 1-6 diamonds and I wanted this to be a trade that shows up ridiculously frequently for shepherds and be usable 5 times before it refreshes after later trades, I could write "custom trades: 1,3,1000,.1,397:1,1,1,264:0,1,6 in order to make that happen (I didn't use buyB or it's range things so I left them blank since authors don't always want to have two trade items). You could add as many trades as you wanted for each villager type. I know that this is probably complicated (I'm not a coder but the lack of trade editors I've seen suggests that it must be difficult) but since it says you take requests then that would be my big request. Thank you for your time and consideration. Have an excellent day! Sorry for the delay. This is a really neat idea and probably complicated, but unfortunately, 1.7.10 is not supported anymore. Sorry! That's a bummer, oh well though, thanks for the reply! No problem! Sorry again by the way. Can you please list in the overview the configs settings that are being added. If you don't want it filling up the page use a spoiler wrapper. Just checking in, seems this mod hasn't been very active. Is it still being developed? At the moment, no, it's not currently being worked on. This doesn't mean the mod is dead, but I've focused more attention on some other projects. Not a problem. Nice quick response, I'll keep any eye on it. Thanks! Have a suggestion for a setting? Reply to this comment to let me know! Any new suggestions should be posted here. Currently, there is the ability to disable crafting tables and the ability to set a custom chat message (with colors and option to display once) for when the player joins the game. I am currently fixing an issue in which the sapling growth multiplier does not correctly work. These were added at the request of parcel31u, more settings are coming soon and if you have any suggestions, please let me know. I might add them. * Another useful feature would be to adjust the damage and attack speed values of vanilla weapons and tools. And maybe even tool durabilities, mining speeds and mining levels as well. I will look into adding these suggestions as soon as I am able to. Thanks!